Over recent years, the status of Saudi women has witnessed a notable development and the Saudi Leadership has strongly supported women by taking several decisions and issuing directives that aim to empower women in accordance with the national identity and Islamic values. In accordance with the Kingdom's Vision 2030, women began to play an influential role in the future of Saudi Arabia. They are given, nowadays, the opportunity to effectively participate in the Kingdom’s sustainable development. As a result of these developments, women have gained many benefits and have been allowed to enter new areas of work in various sectors. Saudi women issues and their participation in the Kingdom’s development has become a top priority for many of the official authorities and the concerned parties. On the other hand, universities and research centers are now focusing on women issues as an important field of research and studies where issues related to family and society can be explored and investigated. Being a university for females, Princess Nourah bint Abdulrahman University seeks to serve women's issues through its vision and strategic goals in accordance with its role and field of work. Thus, the main aim of the "Women’s Studies" program is to study women's issues and needs. This, in turn, will empower women’s status and strengthen their role in the Kingdom’s development. It will also enable the decision makers to plan properly and adopt a development policy according to actual needs. 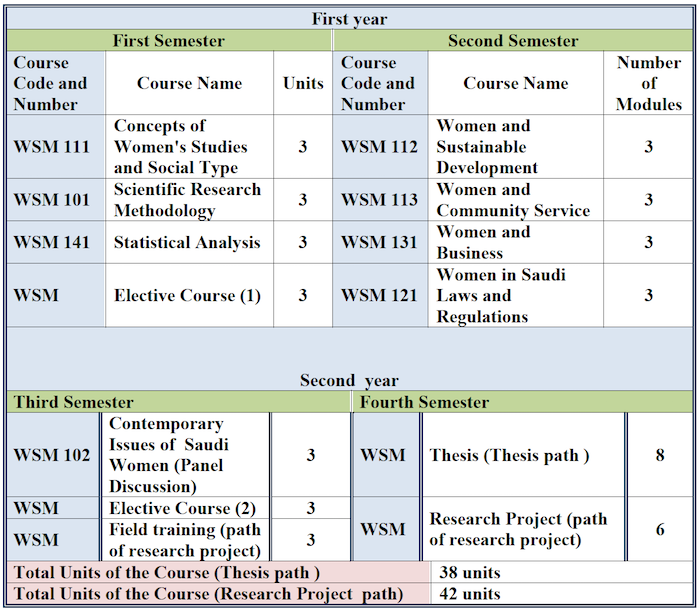 To establish an academic field that is specialized in ‘Women's Studies and Gender’, prepare researchers specializing in women's studies and needs in order to achieve the strategic goals of the university and be in line with the Kingdom's Vision in enhancing the developmental role of women. Developing the student ’s scientific knowledge in the field of women's studies and issues. Developing research skills in the field of women's studies. Building the student’s character to be able to communicate effectively with the community. Integrate and organise knowledge about the goals of women's studies and related concepts. 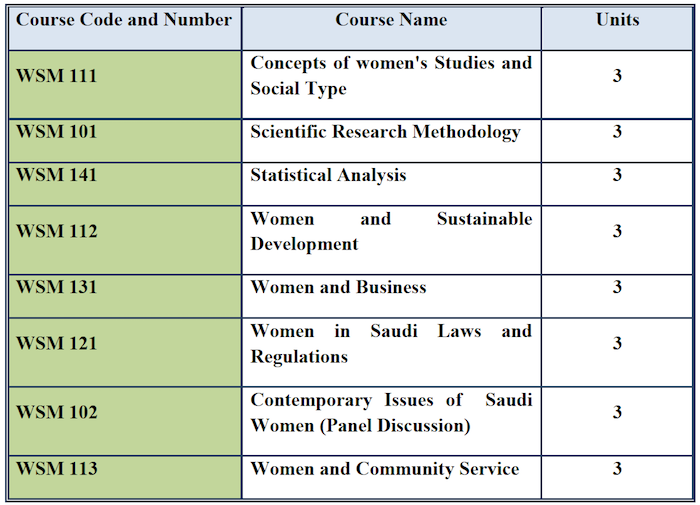 Practice the skills of scientific research in the field of women's studies. Use various sources of data and information efficiently to solve problems. Acquire disciplined behavior and react positively with the workplace environment. Master the use of modern technology efficiently. 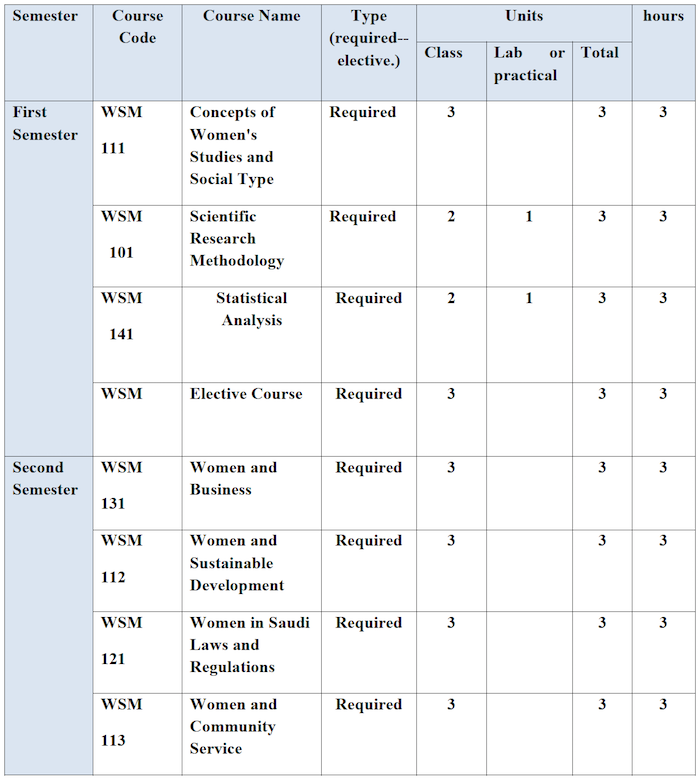 Duration of Study: Not less than 4 semesters and no longer than 8 semesters. 1. Applicant should be Saudi and if Non-Saudi she must be granted a Master's Scholarship from the government. 2. Applicant should have a Bachelor Degree from a Saudi university or any other accredited university. 3. Applicant should have a certificate of good conduct and a clean bill of health, endorsed by a medical report from an accredited medical authority. 4. Applicant should submit two academic recommendations. 5. Applicant should submit an approval from her work if she is an employee. 6. Applicant should hold a bachelor degree with a minimum grade (very good); i.e. (B), and the Deanship of Graduate Studies may accept applicants with a high (good )grade; i.e. (C+). 7. Applicant should pass the personal interview. 8. Applicant should obtain a minimum score of (65) in the Post-Graduate General Aptitude Test. 9. Applicant should obtain a score not less than 450 in TOFEL or 4.5 in IELTS.